In the British Midlands, this tends also to be called the Midland thorn, which is a similar plant to the whitethorn. Its other name is May, as this is its normal flowering time. In ogham it is huath. 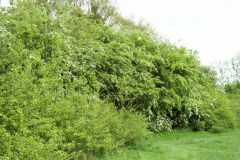 In folk law, the May tree was considered a repositary for the old Wild magic, which is why may blossom was never brought into the home, Wild magic can be very destructive if confined.